Although conventional wisdom leads many to specialize in certain branches of biology, I must confess that I have been unable to do so. I am interested in too many things to choose one area to focus on. However, I have centered most of my research in two major areas: hormone-immune studies involving whole organisms in their environments, and natural history and ecology studies of amphibians and reptiles. Most of my research has a large field component, but most projects also include lab components. I integrate ecological, phylogenetic, and physiological approaches, and have used techniques ranging from mark-recapture to molecular characterization of immune status. Collaboration with other laboratories has been the key factor enabling me to branch out into fields that I have an interest in, but less technical experience with. To date most of my work has been conducted in North America, however, my research has taken me from the northeastern United States through the Caribbean and Central America, as well as to Australia. Amphibians and reptiles are underrepresented in studies of transmission ecology of dangerous pathogens, due mostly to the misconception that since they are “cold blooded,” they do not contribute in any substantial way. In our research we showed that ectoparasite networks are highly organized into centralized, nested clouds of interactions, and therefore most vertebrates, including ectotherms, are always near and in potential contact with another species’ blood supply via ectoparasites. Moreover, by using comparative techniques within an evolutionary context, we showed that certain reptiles may contribute to the transmission of viruses with broad host ranges. However, we only fully understood this after considering their physiology and immune idiosyncrasies. *Research is continuing, and by integrating studies of comparative immunology and parasitology in ectotherms, I hope ultimately to be able to better inform models of disease transmission dynamics. My master’s and dissertation research focused on reproductive endocrinology of the Cottonmouth (Agkistrodon piscivorus), with an emphasis on interactions between the environment, hormones, and immunity. I have amassed a repertoire of laboratory techniques to measure the hormonal and immune profiles of non-traditional model organisms, and as a post doctoral researcher at Penn State I have used them to test novel hypotheses about the non-lethal, but pervasive physiological effects of invasive species (Fire Ants) on native lizards (Fence Lizards) and the physiological consequences of invasiveness on an exotic amphibian (the Cane Toad). By collaborating with labs with diverse investigative tools, I have tested evolutionary and comparative biological hypotheses using diverse techniques, including genetic analyses and fine-scale, geomorphic morphometric measurements of head shape. 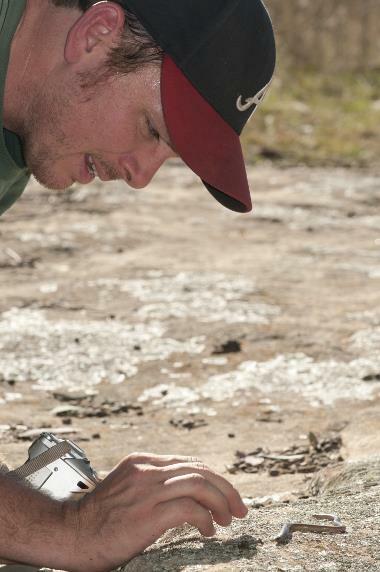 For many of these projects I play two key roles: I am the field collector of salamanders and their tissue, and also generated ideas for the projects. Several areas garner specific focus: phylogeography and comparative biology of the closely-related, but habitat segregated Southern Two-lined Salamander (Eurycea cirrigera) and Brownback Salamander (E. aquatica). Comparison of allopatric vs. sympatric populations of the Southern Zigzag Salamander (Plethodon ventralis) and Webster’s Salamander (P. websteri). Natural history of the Valley and Ridge Salamander (Plethodon hoffmani). Phylogeography of the Seepage Salamander (Desmognathus aeneus). Due to alarming and often unexplained declines in populations of amphibians and reptiles, the diversity, status, and distribution of amphibians and reptiles are areas in need of increased attention. Natural history and distributional information, including baseline inventories of important areas with conservation merit (e.g., national parks and forests), fuel larger analyses of ecological and evolutionary importance. These studies are often terrific introductory experiences for undergraduate and beginning graduate students, and are in my opinion important public services. My primary contribution to conservation has been pro bono inventories for national forests and rare species conducted for underfunded government conservation organizations. My interests extend beyond my favorite vertebrates to others, such as birds, fish, mammals, invertebrates, and plants, which I am keen to maintain an interest in for more effective teaching, to encourage the growth of a particular student’s interest, or to develop collaborations with other faculty. 32. Graham, S.P. How frequently do Cottonmouths bask in trees? Journal of Herpetology, in press. 31. Graham, S.P., M. Alcorn, E.K. Timpe, and J.M. Deitloff*. Seasonal variation of primary and secondary sexual characteristics in the plethodontid salamanders Eurycea aquatica and E. cirrigera. Herpetological Conservation and Biology, in press. 30. Burkett-Cadena, N. D., S.P. Graham, L. Giovanetto. Resting environment preference of some Costa Rican mosquitoes. Vector Ecology, in press. 29. Alcorn, M., S.P. Graham, E.K. Timpe, J.M. Deitloff, and C. Guyer*. 2012. Comparison of head shape sexual dimorphism between Eurycea cirrigera and E. aquatica. Journal of Herpetology, in press. 28. Bingham, A., S.P. Graham, N.D. Burkett-Cadena, G. White, and T. Unnasch. 2012. Detection of Eastern Equine Encephalomyelitis virus in North American snakes. American Journal of Tropical Medicine and Hygiene, in press. 27. Graham, S.P., D. Beamer, and T. Lamb. 2012. Good news at last: the conservation status of the seepage salamander (Desmognathus aeneus). Herpetological Conservation and Biology 7: 339-348. 26. Graham, S.P., C. Kelehear, G. Brown, and R. Shine. 2012. Corticosterone-immune interactions during captive stress in invading Australian cane toads (Rhinella marina). Hormones and Behavior 62: 146-153. 25. Graham, S.P., D. Steen, R. Birkhead, and C. Guyer. 2012. The amphibians and reptiles of Tuskegee National Forest. Bulletin of the Alabama Museum of Natural History 29: 1-59. 24. Graham, S.P. et al. 2012. * The second known contact zone between Plethodon ventralis and P. websteri, and other records for Bibb County, Alabama. Herpetological Review 43: 41-44. 23. Graham, S.P., H. K. Hassan, G. White, C. Guyer, and T.R. Unnasch. 2012. Serosurveillance of amphibians and reptiles to Eastern Equine Encephalitis Virus in Alabama, USA. American Journal of Tropical Medicine and Hygiene 86: 540-544. 22. Graham, S.P., N. Freidenfelds, G. McCormick, and T. Langkilde*. 2012. The impacts of invaders: basal and acute stress glucocorticoid profiles and immune function in native lizards threatened by invasive ants. General and Comparative Endocrinology 176: 400-408. 21. Steen D.A., K.C. Jones, J.B. Jensen, B.K. Rincon, J.C. Godwin, and S.P. Graham. 2011. New amphibian and reptile county records for the Florida Panhandle. Herpetological Review 42: 576-577. 20. Graham, S.P., R.L. Earley, and M.T. Mendonça. 2011. Innate immune performance and steroid hormone profiles of pregnant vs. nonpregnant snakes (Agkistrodon piscivorus). General and Comparative Endocrinology 174: 348-353. 19. Graham, S.P., E.C. Soehren, G.R. Cline, C.M. Schmidt, W.B. Sutton, J.R. Rayburn, S.H. Stiles, and J.A. Stiles. 2011. Conservation status of Hellbenders (Cryptobranchus alleganiensis) in Alabama, USA. Herpetological Conservation and Biology 6: 242-249. 18. Jensen, J.B., D.J. Stevenson, S.P. Graham, et al. 2011. Additional distributional records of amphibians and reptiles in Georgia, USA. Herpetological Review 42: 250-255. 17. Burkett-Cadena, N.D., C. McClure, R. Lignon, S.P. Graham, C. Guyer, G. Hill, S. S. Ditchkoff, M. Eubanks, H. K. Hassan, and T.R. Unnasch. 2011. Host reproductive phenology drives seasonal patterns of host use in mosquitoes. PLoS ONE 6(3): e17681. 16. White, G., C. Ottendorfer, S.P. Graham, and T.R. Unnasch. 2011. Competency of reptiles and amphibians for Eastern Equine Encephalitis Virus. American Journal of Tropical Medicine and Hygiene 85: 421-425. 15. Graham, S.P., E.K. Timpe, and L.R. Laurencio. 2010. Status and possible decline of the Southern Dusky salamander (Desmognathus auriculatus) in Georgia and Alabama, USA. Herpetological Conservation and Biology 5: 360-373. 14. Graham, S.P., E.K. Timpe, M. Alcorn, and J. Deitloff. * 2010. Notes on reproduction in the Brownback salamander, Eurycea aquatica. IRCF Reptiles & Amphibians 17: 168-172. 13. Graham, S.P., and E. Borda. 2010. First record of leech parasitism in the salamander family Sirenidae. Comparative Parasitology 77: 105-107. 12. Graham, S.P., D.A. Steen, K.T. Nelson, A.M. Durso, and J.C. Maerz. 2010. An overlooked hotspot? Rapid biodiversity assessment of an area of exceptional herpetofaunal richness in Georgia. Southeastern Naturalist 9: 19-34. 11. Graham, S.P. 2010. Visitors to southeastern hawkmoth flowers. Southeastern Naturalist 9: 413-426. 10. Graham, S.P. et al. 2010. An additional bioblitz competition in northwest Georgia yields new county records. Herpetological Review 41: 383-384. 9. Graham, S.P. et al. 2009. One hundred and one new county records for Alabama amphibians and reptiles. Herpetological Review 40: 367-371. 8. Graham, S.P., H. Hassan, N.D. Burkett-Cadena, C. Guyer, and T. Unnasch. 2009. Nestedness of ectoparasite-vertebrate host networks. PLoS ONE 4(11): e7873. 7. Timpe, E.K., S.P. Graham, and R. Bonnet. 2009. Phylogeography of the Brownback salamander reveals patterns of local endemism in Southern Appalachian springs. Molecular Phylogenetics and Evolution 52: 368-376. 6. Graham, S.P., R.L. Early, S.K. Hoss, G.W. Schuett, and M.S. Grober. 2008. The reproductive biology of male cottonmouths (Agkistrodon piscivorus): Do plasma hormones predict the mating season? General and Comparative Endocrinology 159: 226-235. 5. Burkett-Cadena, N.D, S.P. Graham, H.K. Hassan, C. Guyer, M.D. Eubanks, C.R. Katholi, and T.R. Unnasch. 2008. Blood feeding patterns of potential arbovirus vectors of the genus Culex targeting ecothermic hosts. American Journal of Tropical Medicine and Hygiene 79: 809-815. 4. E.K. Timpe, S.P. Graham, and M.G. Levy. 2008. Occurrence of the fungal pathogen Batrachochytrium dendrobatidis (Bd) in Georgia’s amphibian populations. Herpetological Review 39: 447-449. 3. Huddleston, G.G, J.C. Paisley, S.P. Graham, M.S. Grober, and A.N. Clancy. 2007. Implants of estradiol conjugated to bovine serum albumin in the male rat medial preoptic area promote copulatory behavior. Neuroendocrinology 86: 249-259. 2. Graham, S.P., E.K. Timpe, and L. Giovanetto. 2007. Significant new records for Georgia herpetofauna. Herpetological Review 38: 494-496. 1. Graham, S.P., V.M. Johnson, and E.K. Timpe. 2007. A bioblitz competition to assess a distribution gap in Georgia herpetofaunal records. Herpetological Review 38: 493-494. Steen, D.A., S.P. Graham, and C. McClure. Relative influence of climate, weather, and seasonality on anuran reproductive activity. Canadian Journal of Zoology, in review. 35. G. Brooks and S.P. Graham. * Hyla gratiosa (Barking Treefrog) Geographic Distribution. Herpetological Review, in review. 34. G. Brooks and S.P. Graham. * Agkistrodon contortrix (Copperhead) Geographic Distribution. Herpetological Review, in review. 33. G. Brooks and S.P. Graham. * Hemidactylus turcicus (Mediterranean Gecko) Geographic Distribution. Herpetological Review, in review. 32. Newman, J.C., and S.P. Graham. * Anaxyrus quercicus (Oak Toad) Geographic Distribution. Herpetological Review, in review. 31. Newman, J.C., T. Robbins, and S.P. Graham. 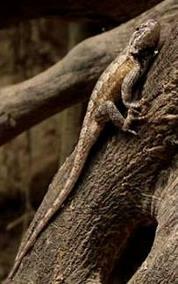 * Sceloporus undulatus (Eastern Fence Lizard Envenomation. Herpetological Review, in review. 30. Newman, J.C., and S.P. Graham. * 2012. Aspidoscelis sexlineatus (Six-lined Racerunner) Geographic Distribution. Herpetological Review, in press. 29. Newman, J.C., and S.P. Graham. * 2012. Lampropeltis getula (Eastern Kingsnake). Geographic Distribution. Herpetological Review, in press. 28. Thawley, C. and S. P. Graham. 2012. Eurycea chamberlaini (Chamberlain’s Dwarf Salamander). Geographic Distribution. Herpetological Review 43:296. 27. Graham, S.P. 2011. Pituophis melanoleucus (Pinesnake). Geographic Distribution. Herpetological Review 42: 395. 26. Graham, S.P., and J.B. Jensen. 2011. Eurycea chamberlaini (Chamberlain’s Dwarf Salamander). Geographic Distribution. Herpetological Review 42: 383. 25. Graham, S.P., and J.B. Jensen. 2011. Eurycea chamberlaini (Chamberlain’s Dwarf Salamander). Habitat. Herpetological Review 4: 580. 24. Jensen, J.B., K. Sorensen, and S.P. Graham. 2011. Macrochelys temminckii (Alligator Snapping Turtle). Geographic Distribution. Herpetological Review 42: 566. 23. Graham, S.P., and N. Burkett-Cadena. 2011. Similisca baudinii (Mexican Treefrog). Predation. Herpetological Review 42: 91. 22. Graham, S.P., B. Smith, L. Giovanetto, and C. Guyer. 2011. Engystomops pustulosus (Tungara Frog). Predation. Herpetological Review 42: 84. 21. Birkhead, R.G., S.M. Boback, and S.P. Graham. 2011. Pseudotriton ruber vioscai (Southern Red Salamander. Geographic Distribution. Herpetological Review 42: 106. 20. Graham, S.P. 2010. Farancia abacura (Red-bellied Mudsnake). Geographic Distribution. Herpetological Review 41: 516. 19. Graham, S.P., E. Borda, and M. Connell. * 2010. Agkistrodon piscivorus (Cottonmouth) Ectoparasite. Herpetological Review 41: 88. 18. Graham, S.P., M. Connell, and K. Gray. * 2010. Agkistrodon piscivorus (Cottonmouth) Diet. Herpetological Review 41: 88-89. 17. Graham, S.P., and Z. Felix. 2010. Desmognathus aeneus (Seepage Salamander). Geographic Distribution. Herpetological Review 41: 240. 16. Graham, S.P. 2010. Pseudacris brachyphona (Mountain Chorus Frog). Geographic Distribution. Herpetological Review 41: 241. 15. Felix, Z., and S.P. Graham. 2010. Pseudacris feriarum (Upland Chorus Frog). Geographic Distribution. Herpetological Review 41: 241. 14. Graham, S.P. 2010. Gyrinophilus porphyriticus (Spring Salamander). Geographic Distribution. Herpetological Review 41: 241. 13. Graham, S.P., and W.H. Smith. 2010. Desmognathus aeneus (Seepage Salamander) Habitat. Herpetological Review 41: 329. 12. Graham, S.P., and G. G. Sorrell. 2010. Agkistrodon piscivorus (Cottonmouth) Intersexual Combat. Herpetological Review 41: 359-360. 11. Graham, S.P., E.C. Soerhen, and R.L. King. 2010. Nerodia rhombifer (Diamondback Watersnake). Geographic Distribution. Herpetological Review 41: 381. 10. Graham, S.P., S.K. Hoss, and J.C. Godwin. 2009. Phaeognathus hubrichti (Red Hills Salamander) Leucism. Herpetological Review 40: 197. 9. Graham, S.P., S.K. Hoss, and J.C. Godwin. 2009. Phaeognathus hubrichti (Red Hills Salamander) Record Size. Herpetological Review 40: 196. 8. Graham, S.P., and G.G. Sorrell. 2009. Acris gryllus (Southern Cricket Frog) Predation. Herpetological Review 40: 198. 7. Graham, S.P. 2009. Desmognathus aeneus (Seepage Salamander) Geographic Distribution. Herpetological Review 40: 232-233. 6. Graham, S.P., and K. Gray. 2009. Pseudacris ornata (Ornate Chorus Frog) Geographic Distribution. Herpetological Review 40: 447. 5. Graham, S.P., C. Kohn, and A. Kohn. 2009. Hemidactylus turcicus (Mediterranean Gecko) Geographic Distribution. Herpetological Review 40: 453. Distribution. Herpetological Review 39: 231. 3. Graham, S.P., and G.G. Sorrell, 2008. Kinosternon subrubrum (Eastern Mud Turtle) Diet. Herpetological Review 39: 218. 2. Graham, S.P. 2008. Gyrinophilus porphyriticus (Spring Salamander) Geographic Distribution. Herpetological Review 39: 477. 1. Graham, S.P., G.G. Sorrell, R.D. Birkhead, S.K. Hoss, and C. Raimond. 2008. Eurycea chamberlaini (Chamberlain’s Dwarf Salamander) Geographic Distribution. Herpetological Review 39: 476. Graham, S.P., C. Kelehear, and T. Langkilde. Trouble in Paradise: the behavioural responses of native lizards to invasive ants in the British Virgin Islands. In preparation for Journal of Zoology. C. Kelehear, S.P. Graham, and T. Langkide. Responses to invasive ants by the dwarf gecko Sphaerodactylus macrolepis. In preparation for: Animal Behaviour. Graham, S.P., L. Swierk, and T. Langkilde. Explosive Stress: Baseline and Post-stressor Glucocorticoid Levels within the Brief Mating Season of Wood Frogs. In preparation for Hormones and Behavior. Graham, S.P., N. Freidenfelds, C. Thawley, T. Robbins, and T. Langkilde. Are invasive species stressful? Glucocorticoid response of native lizards to invasive ants in three experimental contexts. in preparation for Physiological and Biochemical Zoology. Graham, S.P., B. Carlson, C. Thawley, and T. Langkilde. Aspects of the natural history of the Valley and Ridge Salamander, Plethodon hoffmanni. In preparation for: Journal of Herpetology. Graham, S.P. et al. The Alabama Redbelly turtle and Mobile Bay’s diverse turtle fauna. In preparation for: the Alabama Museum of Natural History Bulletin series. Graham, S.P. et al., The Amphibians and Reptiles of Conecuh National Forest, Escambia and Covington counties, Alabama. In preparation for: the Alabama Museum of Natural History Bulletin series. Graham, S.P. et al., The Amphibians and Reptiles of Eglin Air Force Base, Santa Rosa, Okaloosa, and Walton counties, Florida. In preparation for: North American Fauna.